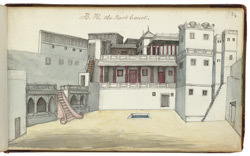 Bhuj was the capital of the former princely state of Kutch, located in the Western part of Gujarat. It is an old walled town full of palaces, pavilions and highly decorated Hindu temples. The Aina Mahal (old palace) was built by Rao Lakha in c. 1750 and is located on the north-west side of the lake. The palace is built in the traditional architectural style of the region with a small fortified courtyard in front.